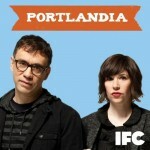 “Portlandia” is an IFC show I love. It’s about two hippies – Fred Armisen (SNL) & Carrie Brownstein – they play various characters in skits about and around Portland, OR. The show basically has no budget but it is hilarious!!! Posted in Uncategorized on February 25, 2012 by aubadegirl.